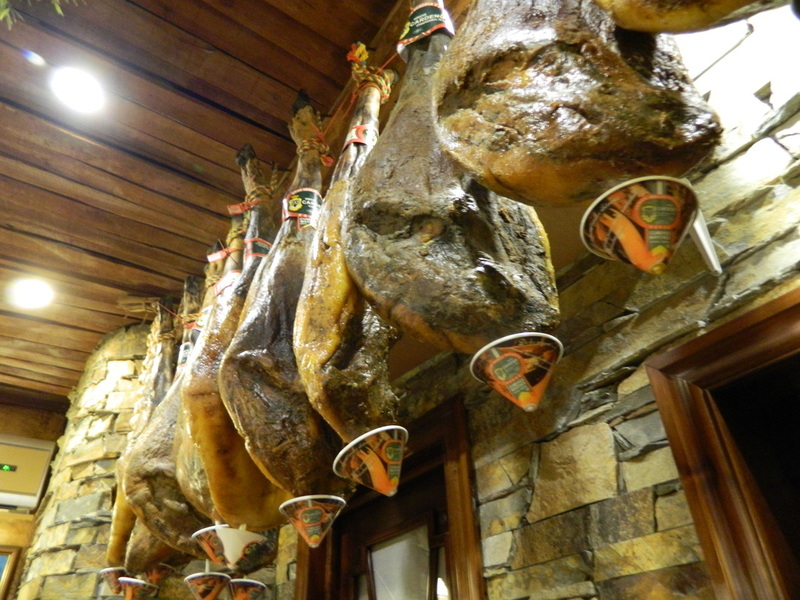 Jamon Serrano, (pronounced ham-own, and literally meaning hill ham) is THE meat of Spain. Fresh hams are trimmed and cleaned, then stacked and covered with salt for about two weeks in order to draw off excess moisture and preserve the meat from spoiling. The salt is then washed off and the hams are hung to dry for about six months. Finally, the hams are hung in a cool, dry place for six to eighteen months, depending on the climate, as well as the size and type of ham being cured. The drying sheds (secaderos) are usually built at higher elevations, which is why the ham is called hill ham or mountain ham. Jamon Serrano is generally served raw in thin slices. It's definitely an acquired taste, which I have not yet acquired. Hams are hanging everywhere here. The cone-shaped bowls attached to the bottom of each ham are designed to catch the drips as the ham dries out...but, watch out! Sometimes they drip...mind where you sit and watch for hams overhead when you go for tapas! As a new resident of southern Spain and an avid eater of cheese, it was love at first bite when I discovered Queso Manchego (Manchego Cheese) in a local tapas bar. I ordered just a simple sandwich of bread and cheese, but one bite in, I knew immediately this was no ordinary cheese. Queso Manchego is unique to Spain, produced solely in the La Mancha region of central Spain, and is named for the Manchega breed of sheep that produce the milk for this cheese. Manchega sheep graze in the high, wind-swept plains of the La Mancha region, eating only regional vegetation, which gives their milk the specific flavor that is imparted to the cheese. If you’ve brushed up on Don Quixote since arriving here, you might recall that the La Mancha region was the setting for this book. Varying from white to ivory- yellow in color, Queso Manchego has a firm texture ranging from buttery to crumbly, depending on how long it’s been aged. Same goes for the flavor…the older the cheese, the higher the “pungency” factor, so the younger cheeses are a bit more on the mild side. The rind varies from pale yellow to light-brownish in color and is inedible, so don’t eat that part! True Manchego has a basket-weave pattern in the rind created by the molds used in production today, replicating the ancient tradition of wrapping the cheese in grasses to cure, creating this unique texture. To qualify as true Manchego, the cheese must age for a minimum of 60 days. Queso Viejo (literally “Old Cheese”) is aged the longest, for a minimum of one year. It has a delicious, sharp tanginess to it, and is my personal favorite. Queso Manchego is delicious on its own, with bread or meats, or simply paired with a good glass of Spanish wine. It’s best served after its been out of the fridge for about 20 minutes… a few minutes at room temperature really enhances the complex flavor and texture of this wonderful cheese. Try layering slices between the halves of a warm, toasted baguette. Delicious! Others might add meats or tomatoes, but for a cheese purist like me, solo Manchego is the best! Spain takes this cheese very seriously, and has protected it under the “Denominacion de Origen” regulatory classification system. Manchego Cheese has been granted Protected Designation of Origin status by the European Union, and there is even a Manchego Regulatory Council that is dedicated to protecting the production of this very special cheese. In fact, only farms that have been granted Denominacion de Origen (DO) status are permitted to produce true Manchego cheese. When shopping for Queso Manchego, look for a small sticker somewhere on the package stating “Denominacion de Origen” to make sure you are getting authentic Manchego cheese. There are many fantastic cheeses out there, but if you want the real deal, this sticker is key. Other things to look for on the label are the words “curado” or “semicurado.” Curado literally means “cured,” but where cheese is concerned, it denotes that it’s been aged for at least 8 months. Semicurado will have aged a minimum of 60 days, and these cheeses will have a milder flavor. The word “oveja” on the label (meaning “sheep”) just means that the cheese is made from sheep’s milk. Cheese labeled “artisan” usually has been produced with unpasteurized milk, so if you want the pasteurized version, steer clear of anything labeled artisan or artesano. Local grocers carry a wide variety of wonderful Spanish cheeses which I can’t wait to try as well, but if you’re looking for an authentic Spanish culinary experience, it doesn’t get more Spanish than Queso Manchego. Enjoy!